Cal Pump Direct Drive Torpedo Pumps feature an innovative, custom design that will stand up to the rigors of constant pond use. These energy efficient pumps are water-cooled, use no oil, and may be used both as submersible and in-line pumps. Because there is no oil, there is no danger of this pump leaking oil into the pond, which can be harmful or fatal to fish and plants. 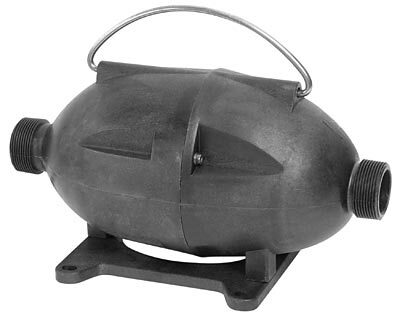 Constructed with non-corrosive components and a unique torpedo design, these hardy pumps ensure safe, efficient, and continuous operation without fear of harm to ornamental fish or aquatic plants. This Cal Pump Direct Drive Torpedo Pump is ideal for large ponds, water gardens, waterfalls, statuary, and other decorative water features. Its ingenious design offers incredible versatility. Use this pump as a submersible pump or use it as an in-line pump. Operate the pump horizontally on its attached base or stand it on a pre-filter for vertical operation. Easily maneuver the pump using the attached metal loop handle. This pump features a 0.33 Hp direct drive motor capable of turning 4000 gph at 1 foot. This pump accepts female 1 1/2" NPT threaded fittings. Six month warranty.